An eclectric mix of plants can add interest and character to a garden space closely linked to the house. Today's irrigation technology allows for plant pairings that would have been more difficult in the mid-century garden. In this garden designed by Risner, mass planting of ornamental grasses is a design idea that is very compatible with MCM architecture. "Good landscape architecture design should be thought of from the inside out. 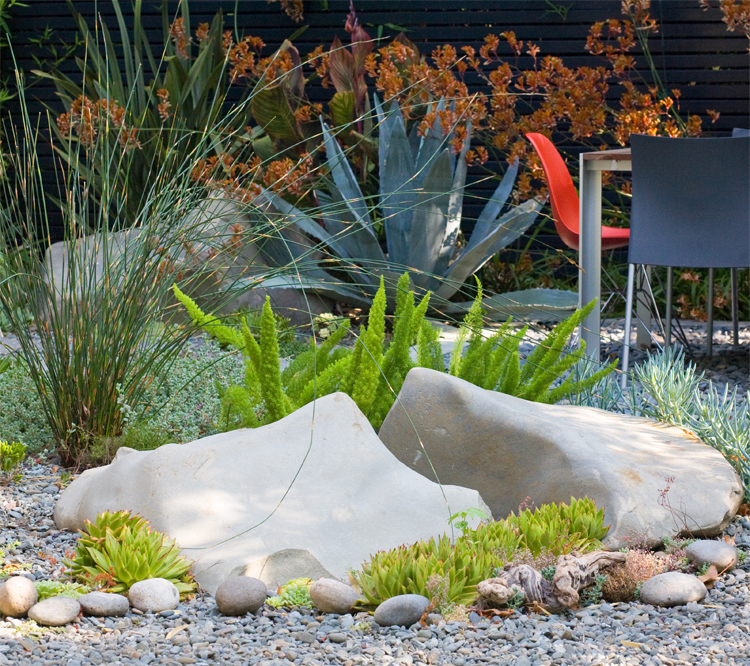 It needs to be functional relative to the space it's next to, as well as visually aesthetically pleasing when not in use," says Richard Risner, principal landscape architect for Grounded, in Encinitas. "A good designer should be able take design cues from the architecture or interior to create a seamless flow of design so nothing looks like an afterthought." Hardscape—namely concrete—was arguably the most important feature in mid-century modern landscaping and still is today. While middle-class families in the early 1900s employed a housekeeper and a gardener, families in the '50s were doing their own landscaping and yard maintenance. 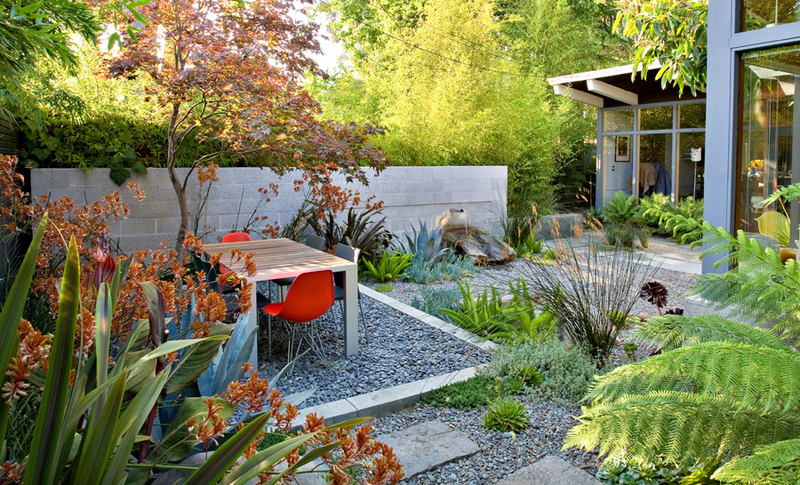 Concrete patios and redwood headers were the answer to low-maintenance landscaping needs. "Postwar designers were really interested in the possibilities of concrete. It was durable, relatively inexpensive, and could be shaped and finished in any number of ways. It truly fit the vibe of the period," Miller says. "The 'Baby Boomer' generation wanted low-maintenance spaces where kids could ride tricycles, and parents could set up a picnic table and then hose off the patio when it was time to clean up." The hardscape, patios, and outdoor rooms are the most important areas of a landscape design because they define the spaces, according to Risner. "Hardscape areas where people walk, entertain, relax, and gather are often the social zones of the outdoor spaces and need to be designed appropriately to create the ultimate outdoor room," he says. 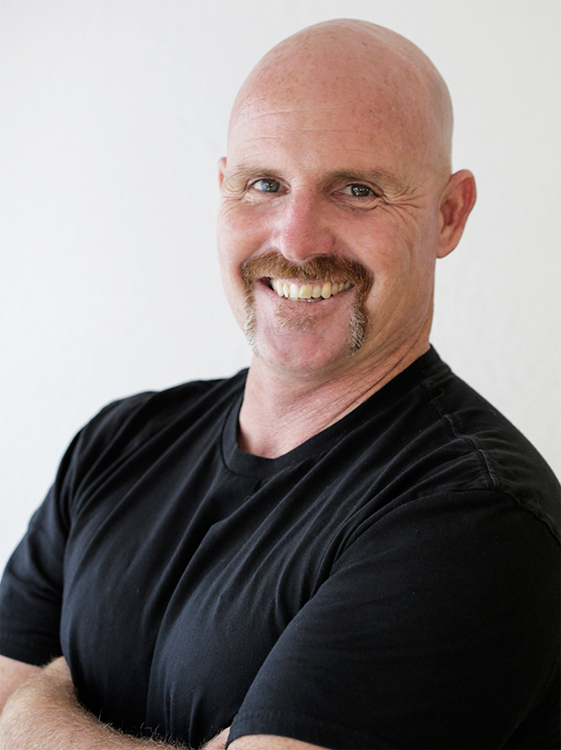 "One mistake I often see is that patio spaces are too small. Outdoor furniture is typically oversized, and the space needs to be planned accordingly to accommodate that type of furniture." Concrete is still the material of choice for contemporary installations, but many landscape architects are also using permeable paving that allows rainwater to flow through and irrigate the garden. When designing a landscape plan, it's wise to consider the entire palette and texture of the materials to make sure they accent the house in a thoughtful way. "The best material is any material that relates to the architecture and is appropriate for the hardscape, although I prefer to use materials that are raw in their pure or natural form," Risner says. "For example, if you use wood, then let it be wood—don't paint it. If you use concrete block, let it be concrete block—don't stucco it. Let steel rust, let copper and bronze patina. As they change over time, it enhances the texture of the landscape."